Frequently Not Asked Questions (FNAQ) is a new feature on this blog. This feature will appear infrequently, so I suggest that you frequently not expect it. This is a great question. Thank you for asking. First, let me say that it takes time. You cannot rush into it. I’ve discovered what I call the Seven Secrets to Growing Older. (It’s the title of my new book, soon to be launched on the Amazon.) I don’t want to give too much of it away, but I’ll let you in on the first secret: it’s called Monday. In the book, I explain how Monday and the six steps that follow are the key to getting older. I am confident that by practicing these steps over and over, anyone can grow older. In fact, I am so confident that my book comes with a lifetime guarantee! Second, it helps if you start when you’re very young. I began at such a young age that I don’t have any recollection of when I started. Just as many writers can’t remember a time when they didn’t write, I can’t remember a time when I wasn’t getting older. Please don’t think I’m bragging; I’m merely answering the question. Third, you have to stay consistent. You can’t just stop and pick it up at a later date. Once you stop, you lose your chance to continue. This is probably the number one reason so many people fail to get old. Fourth, you have to practice breathing. It’s related to the third point because it requires consistency. Some people find it tedious – in and out, in and out, all the livelong day – but I’ve found that once you do it enough, it becomes automatic. In fact, now I feel that I can’t live without it. I credit time, an early start, consistency, and breathing with my ability to grow old. I would be remiss if I didn’t mention my mother who not only encouraged me in my early efforts but also modeled the seven steps, soon to be revealed in my book. Of course, I don’t discount food and water any more than I discount my book. So glad that you liked it. Thank you for reading. love your writing style, dry, witty and delightfully funny. I’m a new blogger, if you have a sec check out illbeoutinaminute.com i’d love to hear your feedback. I’m delighted that you enjoyed the writing. I will be visiting your blog posthaste. Please advise – I’m 46 years old, to me that’s still quite young, but my teenagers assure me that I am on the pinnacle of death. Am I too old to start reading your book from the beginning – should I start part way through? If i read it fast will it speed up the aging process? I always suggest breathing as a first step. So many people start out breathing and then give up on it. I highly recommend you buy my book to find out the other six steps after Monday that will help you in your quest. All of my books are available for kindling. Congratulations on your oldening success. You haven inspired me to keep trying to olden myself. Thanks, Scott. Growing old is a great hobby; it’s something I plan to do until I die. I’m old school and believe in the simple in and out. When I was younger I tried some variations using burning materials that smell funny, but I don’t recommend that. I agree entirely. Simplest is best. Not burning things, also best. I, myself, do not like to hyperventilate. That is also not a good way to breathe. It requires too many paper bags. I had know idea it was so simple; I guess I can stop worrying now. I admit it looks easy, but I assure you that my book will dissuade you otherwise. Uh, that should say NO idea. Apparently, I have no idea period. I no what you mean. I was getting older, yet I had no idea why. Thanks for the enlightenment! I live for enlightening; it makes me feel shiny. As much as I appreciated the timeliness and entertainment value of your very first FNAQ subject I feel I simply must take a moment to point out that there is at least one exception to the rules of getting old that you may have mistakenly overlooked (kind of like I forgot to end one sentence and begin another, or how I forgot to use appropriate punctuation). Perhaps you could include an extra chapter in your soon to be re-released book about the benefits of staying “young at heart” and “using humor to turn back the clock.” I’ve heard that If you are funny enough, you can actually see the hands of the clock begin to move in a counter-clockwise direction, although I’ve never been funny enough to see the phenomena myself. You seem to be a much more likely candidate to have experienced this unique turn of events. If you do decide to re-release your book, please do not do so on a Monday, because, well, I don’t do Mondays. (I’ve always been a bit of a rule breaker.) If I don’t do Mondays, then I suppose I’ll never even get past step ONE in the whole getting older process. No wonder I still have problems with that pesky fourth step. All those ins and outs over and over again won’t help me find my lost Mondays. Please hurry up with the book. Apparently I need it. p.s. you were a SERIOUS baby. loving the punk hair. what a rebel. I have heard about the phenomenon you mention, but if my face is any indication, and I believe it is, it has never happened to me. If you are experiencing the second step (the one after Monday), I suspect that Mondays are doing you, since you are not doing Mondays. 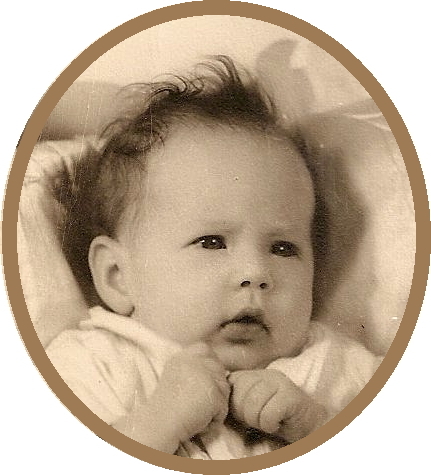 I was a seriously upset baby, having been recently evicted from my first home. I look like a little pugilist, ready to use my right hook. I can’t wait to get your book. I’ve been extremely successful at growing old, but I think we can all learn something new even as we’re busy getting old. I’m certain you will have some terrific hints. I will seek our your endorsement once I get the thing written. I feel so lucky to have stumbled upon your blog a while ago. I marvel at your ability to take simple everyday topics and spin them into a humorous look at life. Thank you for sharing your words every day. You are ALWAYS entertaining and inspiring. I hope you live a long and healthful life so I can keep reading your entries. They put a smile on my face and that keeps MY wrinkles away. Thank you, Carri, for your kind words. I’m glad if I put a smile on your face. I have enough wrinkles for both of us. I love the concept of FNAQ and suggest you continue it. You could go in many different directions with it, all of it hilarious without much sense! Kate, I love your writing and I love your comments. You say what others only think and have summed up this blog perfectly in your last three words. Lovely funny post. I predict your new book will be a bestseller and I look forward to seeing you on Oprah or does she still have a show? And I also look forward to your next FNAQ. I think Oprah owns a network now, but I don’t know if her show is still going. I’m sure that sooner or later, another FNAQ will appear on this blog. Loving this post. Breathing is one of my best attributes. Any day above ground is a good day, don’t you agree? I admire a woman with breathing experience. I like your perspective – above ground beats below ground any day. Such a concept. Getting older by taking it just one day at a time. You are right. I think you will be quite rich and famous from the sales of the books which will explain how to be successful with this new program. It just snuck up on me one day when I wasn’t looking. One day 25, the next day I was 55. You must be really good at breathing to have reached 55! FNAQ’s, I have a many of those that roll around my head with the one marble that is left in there. I, too, have figured out the breathing thing although I am at times a bit short of it. Maybe when your book is available I can find an answer to that. I envy you that one marble, Patricia. I lost mine years ago. I’m glad to hear you’ve found success with breathing – short breaths are better than no breaths at all. I planted several pages in the backyard, but nothing has come up yet. I figured that would be easier than giving birth to a book. Thank you so much. That encourages me a lot. I’ve always considered ‘looking both ways’ before I cross the street the secret of growing old, but now that you mention it, I did start breathing regularly even before that. So far every one I’ve met who is older mentions regular breathing. I can’t wait for your book to be released on the Amazon! I’m super excited to find out what those other steps are. I’ve always suspected there was a breathing link there somewhere. My Mom used to pour cold water on me when I had terrible tantrums as a child ….. she said I turned blue. Which I don’t think is a harbinger of long life. As always I couldn’t resist your link …. I should have known a writer as skilled as you are wouldn’t use an unnecessary article and that I would indeed find the river and not the online store. I floated down it for a while until I realized I was cruising the internet again. And started up my regular breathing pattern …..
You must have had epic tantrums. I’m sorry about that link. I really can’t stop myself sometimes.